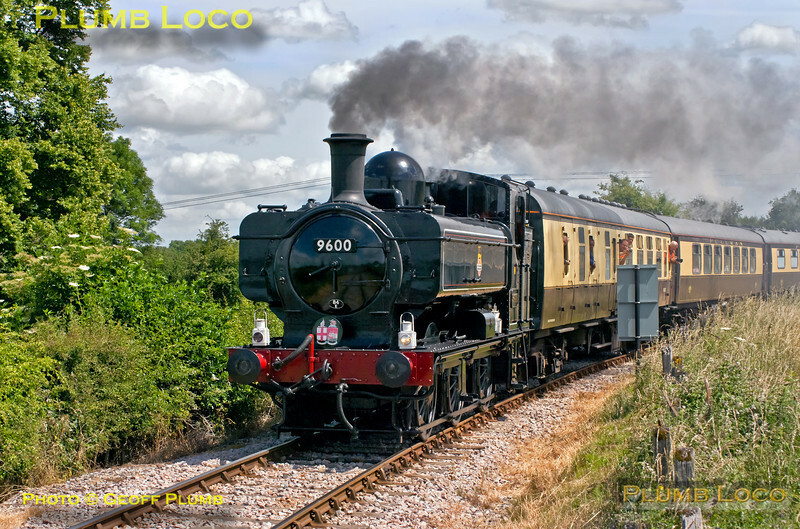 Photos of preserved steam locos in action or repose on the main lines of the UK. The pictures are in chronological order, oldest first! Collection constantly being added to, as time permits! Having run-round the train at Princes Risborough, 9600 is now running along the Chinnor & Princes Risborough Railway, having just negotiated the temporary connection from Network Rail metals at Thame Junction. It is now approaching the first level-crossing on the line at Horsenden Lane, en route to Chinnor with 1Z28, the "Centenary Express". 11:58, Saturday 3rd July 2010. Digital Image No. GMPI6044.